Onamato is a lovely, simple tangle pattern that reminds me of pearls. 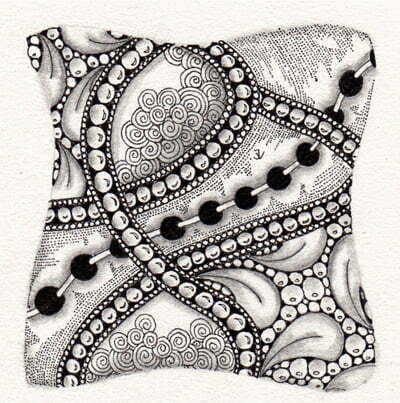 It’s one of the first 102 Zentangle®-original tangles designed by Maria Thomas. Onamato can be used for borders or fills and has potential for lots of variation. Sandy Bartholomew illustrates how to draw the tangle Onamato here. Here is a beautiful example of Onamato within a Zentangle. Remember: these are done on a 3.5″ x 3.5″ (9 cm x 9 cm) tile, so this is pretty close to its actual size. This is the work of CZT® Jella Verelst from Belgium and is shown on TanglePatterns.com with her permission. Jella owns PaperArtStudio and teaches Zentangle as meditative art form. If you live in or near Belgium and want to take a workshop with a master, here is her workshop calendar. A Zentangle® by Jella Verelst using the Onamato tangle pattern. Copyright the artist, ALL RIGHTS RESERVED. Used by permission. Check out the tag zentangle for more Zentangle®-original tangles on TanglePatterns.com; and jellav for Jella’s beautiful Zentangles. I really love this pattern, also love the example!